25 years ago today, Nigeria Airways Flight 2120 (C-GMXQ) was a chartered passenger flight operated by Nationair from King Abdulaziz International Airport, Jeddah, Saudi Arabia to Sadiq Abubakar III International Airport, Sokoto, Nigeria. The Douglas DC-8-61 was carrying 247 passengers & 14 crew members. The accident aircraft C-GMXQ at Faro Airport in 1989. The pilots on board Nigeria Airways Flight 2120 were Captain William Allen, 47 a former Canadian Air Force pilot, had logged 10,700 flight hours. First Officer Kent Davidge, 36, had logged 8,000 flight hours and Flight Engineer Victor Fehr, 46, had logged 7,500 flight hours. 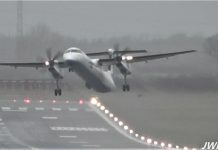 At that time, the aircraft had accelerated to about 80 knots. Marks on the runway showed that the No.1 wheel started to break up at about this time. In addition, the left and right flanges of No.2 wheel began to trace on the runway; rubber deposit from No.2 tire continued which appeared to be from a deflated tire between the flanges. 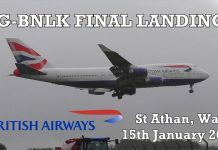 At 51 seconds, the captain called rotate and the airplane lifted off the runway. Witnesses noticed flames in the area of the left main landing gear. The flames disappeared when the undercarriage was retracted. 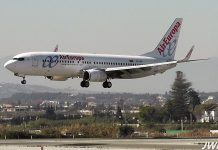 During the next three minutes several indications of system anomalies occurred, which included pressurisation system failure, a gear unsafe light and a loss of hydraulics. 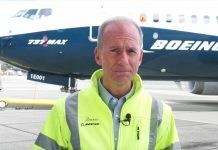 As the aircraft continued on the downwind heading, a flight attendant came into the cockpit and reported “smoke in the back…. real bad.” A few moments later, the first officer said “I’ve got no ailerons.” The captain responded “Ok hang on, I’ve got it”. This was the last record on the CVR which failed along with the FDR at 08:33:33. Meanwhile, during the downwind and base leg, the fire had consumed the cabin floor above the wheel wells, permitting cabin furnishing to sag into the wheel wells. 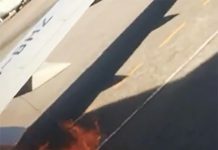 When the gear was probably extended at 11 miles on the final approach, the first body fell out because fire had burned through the seat harness. Subsequently, with the gear down and forceful air supply through the open gear doors, rapid destruction of more floors structure permitted the loss of more bodies and seat assemblies. Despite the considerable destruction to the air frame, the aircraft appeared to be controllable. 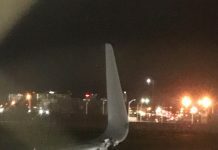 Eight minutes after the aircraft began its take off and 10 miles from the runway, the captain declared an emergency for the third time saying. “Nigeria 2120 declaring an emergency, we are on fire, we are on fire, we are returning to base immediately. The aircraft came in nose down and crashed 9,433 feet short of the runway at 08:38. All 247 passengers & 14 crew members were killed instantly. The crash of Nigeria Airways remains the deadliest accident involving a DC-8 & the deadliest aviation disaster involving a Canadian airline. The Investigation was led by the Canadian Transportation Safety Board. They concluded that prior to departure, the lead mechanic had noticed that the #2 and #4 type pressures were below the minimums for flight dispatch and attempted to inflate them, but no nitrogen gas was readily available, and the project manager, unwilling to accept a delay, disregarded the problem and readied the aircraft for dispatch. As the aircraft was taxiing, the transfer of the load from the under-inflated No.2 tire to the No.1 tire on the same port side axle resulted “in over deflection, over-heating and structural weakening of the No. 1 tyre. “The No.1 tyre failed very early on the take off roll”, followed almost immediately by the No.2. The latter stopped rotating “for reasons not established”, and the subsequent friction of the wheel assembly with the runway generated sufficient heat to start a self-sustaining fire. The crew realised there was a problem, but not the nature or seriousness of it. The aircraft was not equipped with fire or heat sensors in the wheel assembly. When the landing gear was retracted. “Burning rubber was brought into close proximity with hydraulic and electrical system components”, causing the failure of both hydraulic and pressurisation systems that led to structural damage and loss of control of the aircraft.